The history of the rock band Zabranjeno Pušenje (No Smoking) is presented through the story about three of its first members in the movie “No smoking in Sarajevo”. Mostar Film Festival audience had a chance to see it on Sunday, November 27th. More about the movie we could hear in the Movie Discussions with the main actors Sejo Sexon and Zenit Đozić, on Monday, November 28th at the Gallery of Queen Katarina Kosača. “Rock’n’roll and movies have always been associated with the band Zabranjeno pušenje (No Smoking). Our songs always contained some kind of movie heroes. Our endeavor so far has been to make a movie, but since it’s cheaper to have movie heroes in songs we’ve been doing it through music”, said Sejo Sexon the front man of the band, adding that, unlike today’s movies, the movies form the past were “real deal” and the cinemas were always full. In cinematography earlier, as Sexon pointed out, good always prevail over evil because the times were like that. Men and women from Socialism had to believe in it, and one of those heroes was the kung fu fighter for justice – Fudo. “Fudo has always been in the fight against burning problems in the state. Just remember the episodes of Nadreality Show with Fudo where he fights against the flowering of the sea, or the fight against high prices. I think we will realize that today we need him more than ever”, Zenit Đozić commented a character of a hero with whom he had been identifying for a long time. He also added, in his own style, that Fudo was first of all loved the neighborhood folks. Interesting fact about the movie which was discussed in today’s Movie Discussions was the thing that Italian director Gianluca Loffredo sucseded to capture the very essence of the band coming out of the framework of national conflicts and breakdown that was associated with the band Zabranjeno pušenje (No smoking). “I guess somebody from Italy had to come and do it, because somehow it’s always the same story with us. Three sides – three stories. I think Loffredo did an excellent job for just that very reason. He did not grow up in Sarajevo, he didn’t grow up by the music of this band, and that very departure was essential for someone to catch the essence of the band No Smoking. The story about the breakdown is certainly contrived and overblown”, said Antonela Pehar Šimunović, editor of the Documentary program at BHRT, the television that produced the movie. When we mention the band No Smoking, and the surreal world of the last state, inescapable topics are also the movement of New Primitivism. One of its initiators, Zenit Đozić, said that the New Primitivism put the street talk into dominance, which was previously impossible. “Back then all talked in an academic speech and it was impossible to hear the street talk in the public. That is what gave us identity and became popular even in countries that don’t share our language. From the joke of ‘stupid Bosnians’ we made a good thing that it was really great to be a ‘stupid Bosnian’. That’s exactly what New Primitivism stands for, to the extent that there are even doctoral theses written on this subject”, explains Zenit. “Surrealism is today on the streets and we are living it. What we had previously imagined as the most ridiculous scenario, like the University on Sokolac has come to be today. Today we are forced to live that way. Our future is surrounded by the walls and unfortunately it is our realism”, concluded Sexon. 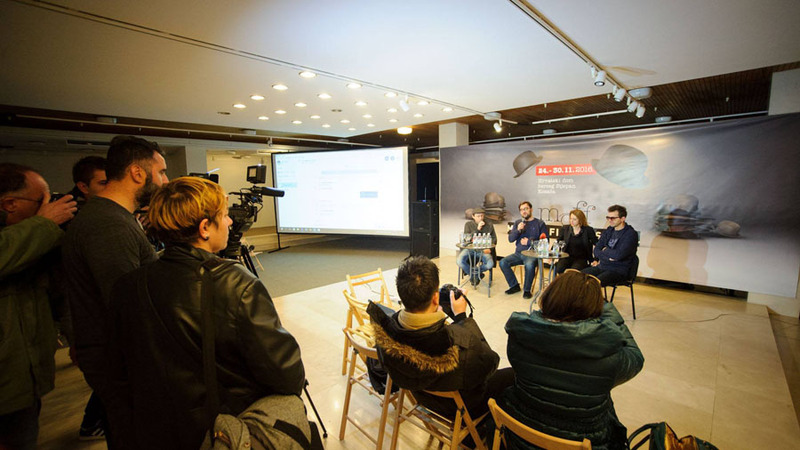 At the very end, the participants of the Movie Discussions discussed the Mostar Premiere of the movie “No smoking in Sarajevo”. They said that they decided that the documentary would also start with the cinema distribution, after the Festival. “Every city has its hero, but not every city has a hero like Bruce Lee”, said Pahar Šimunović alluding on a statue of kung fu master Bruce Lee in Mostar. She also said that they are going to have a TV premier of the movie in the spring and that right after the MOFF they are starting with the cinema distribution.